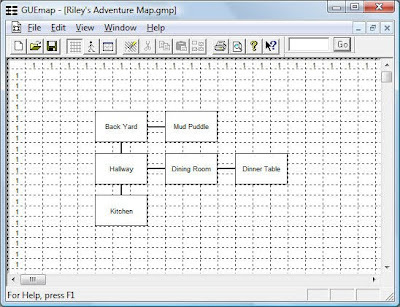 Last week, we gave some thought to the basic concept of our adventure game, starring a puppy named Riley whose only goal in this slice of his life is to confiscate and eat the family's turkey dinner (or some manageable portion of it, say, a leg). This week, we're actually going to start building something using Inform 7. 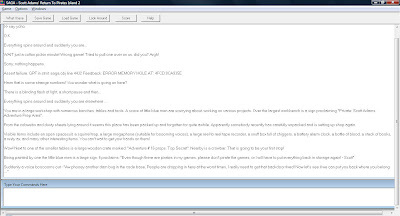 A more substantial project would require considerably more effort in this planning stage, but I'm cutting to the chase here -- our game will be small enough that we can patch up any errors as we go, and I think the lessons learned from my lack of planning will be more interesting than any rules or maxims I might offer. 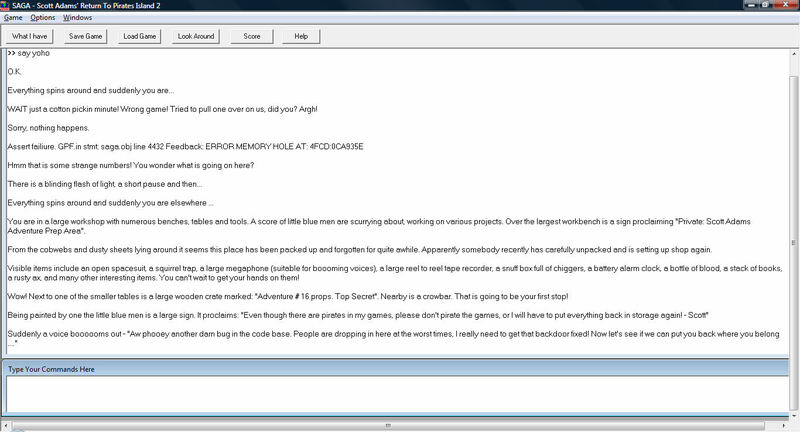 So let's get to work implementing the game world. 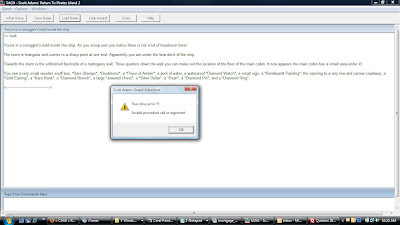 Inform 7's shorthand programming convention expects us to provide description content immediately after establishing that something exists. So as I lay out the map, I'm going to write some preliminary descriptions of each room. I'm also going to establish the location of two key objects I know we are going to need based on our general story concept -- the turkey, and the player. Note that rooms are defined in relation to each other -- if this were a larger map, I'd have to give some more thought to the implementation so I don't lose track of the details. But this design only has a handful of rooms, so I'll just wing it based on my crude map. Mom's Kitchen is a room. "This is where the magic happens. Strange and mysterious scents fill the air, and the floor is always worth checking for treasure." The Hallway is north of the kitchen. "The hallway is often populated by feet and shoes coming and going, but it's quiet at the moment." The Back Yard is north of the hallway. "The back yard is full of grass and bugs and the occasional squirrel. A large tree provides shade on hot summer days. A lovely puddle of mud remains from yesterday's rain." The Mud Puddle is in the back yard. "Mud, glorious mud! Rich and thick and pungent, made of dirt and worms and everything else that is wonderful in this world." The Dining Room is east of the hallway. "This is where the people eat. It is a sumptuous palace of steel and fabric, with chairs rising high into the air. The dinner table dominates the room, overshadowing everything else with its promise of tasty past and future." The Dinner Table is in the Dining Room. The player is in The Back Yard. 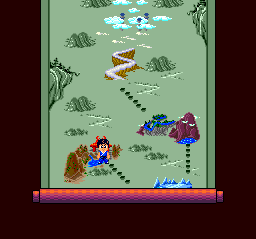 Note that, at this time, there are no obstacles implemented, so we (as the player) are free to maneuver around the map and make sure the layout works. 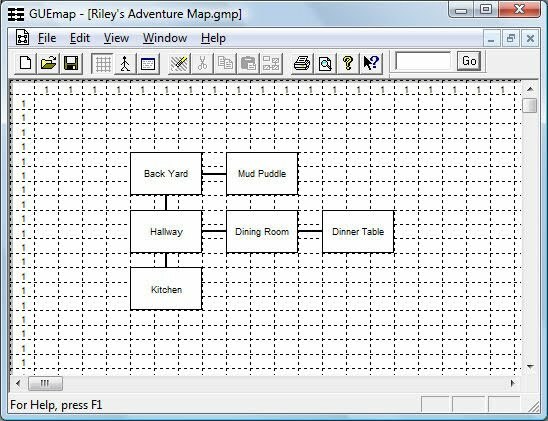 The Inform 7 parser and engine will prevent Riley from going in unworkable directions to places that don't exist, so we don't have to worry about those details. You may also note that my initial room descriptions don't provide any useful detail as to which directions are navigable. 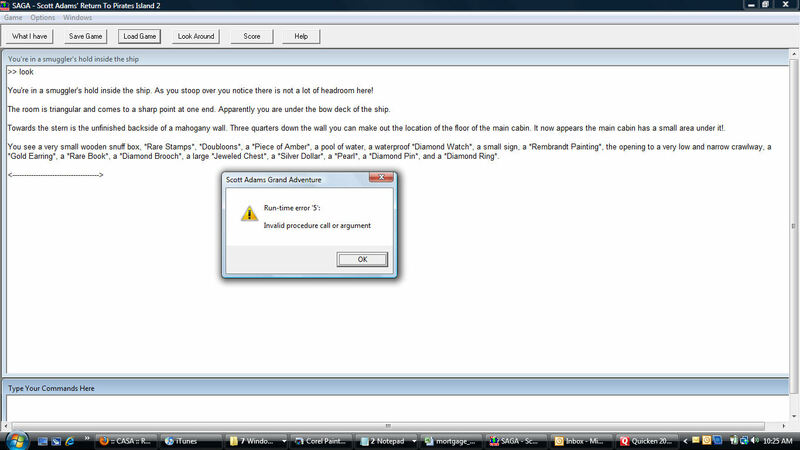 We will fix that for the player's sake, but since we set it up and drew the map, we know how the navigation works. The back yard is full of grass and bugs and the occasional squirrel. A large tree provides shade on hot summer days. A lovely puddle of mud remains from yesterday's rain. Mud, glorious mud! 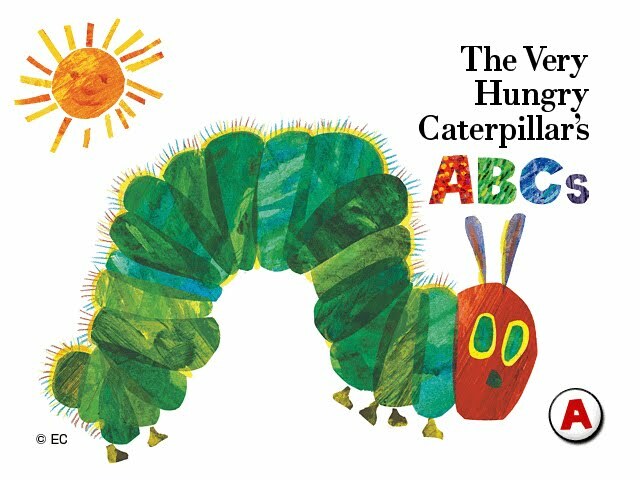 Rich and thick and pungent, made of dirt and worms and everything else that is wonderful in this world. The changes required are rather extensive -- the Back Yard description is changed so as not to include the mud puddle description itself, and the Mud Puddle gets redefined with some special actions. 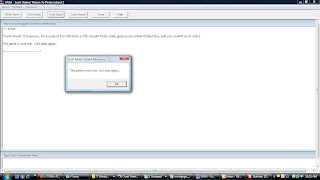 We'll also move the description of the mud to be the target of an explicit EXAMINE command. The Back Yard is north of the hallway. "The back yard is full of grass and bugs and the occasional squirrel. A large tree provides shade on hot summer days." The Mud Puddle is an enterable container. The Mud Puddle is in the Back Yard. "[if the player is not inside the Mud Puddle]A lovely puddle of mud remains from yesterday's rain." After entering the Mud Puddle, say "SPLASH! Mud, glorious mud! It squishes delightfully between your claws." After exiting from the Mud Puddle, say "You hop out of the mud puddle, dripping awesomely muddy water." Instead of taking the Mud Puddle, say "You can probably take some mud with you, but picking the entire puddle up is beyond even your puppy powers." Instead of examining the Mud Puddle, say "It's rich and thick and pungent, made of dirt and worms and everything else that is wonderful in this world." Fixing the dining room table presents a similar challenge. But we want the player to be able to get onto the table, not inside it, so we define it as a supporter instead of a container. The Inform 7 environment will take care of many of the other details -- for example, it assumes that any supporter is fixed in place, so we don't have to explicitly reject attempts to take it. One special thing we want to do to emphasize Riley's small size is make sure that the player has to CLIMB to get onto the table, instead of simply ENTERing it or GOing there, which default supporter behavior allows. We'll flesh this out with more details later to create a puzzle; there are other, and probably better, ways to implement some of this don't-enter-but-climb behavior, but this approach will suffice for now. 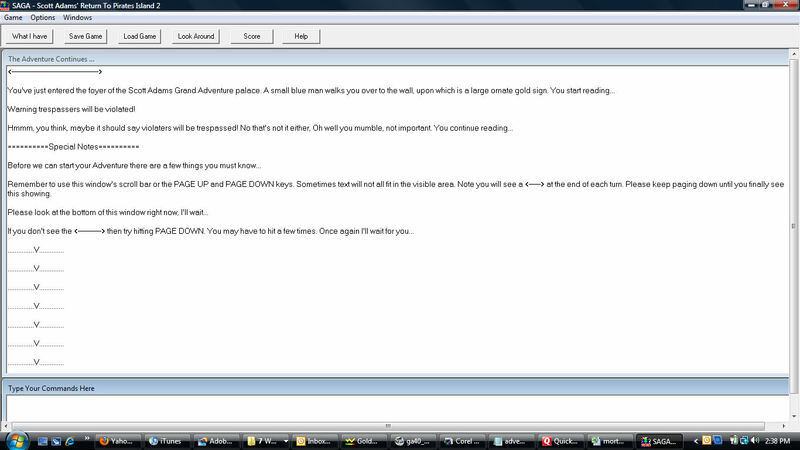 Also, it's reasonable to let the player travel DOWN from the table, with a little descriptive detail for the jump down. And we should make sure that the player can't break the world's reality by repeatedly climbing up once Riley is already on the table. We're also covering one new detail here -- we want to represent the Dining Room itself differently from different perspectives, depending on whether Riley is on the floor looking up, or is currently standing on the table. So we'll add some conditional logic to that room's description using Inform 7's [if][otherwise][end if] conditional phrasing. The Dining Room is east of the hallway. "This is where the people eat. It is a sumptuous palace of steel and fabric, with chairs [if the player is not on the Dinner Table]rising high into the air. [otherwise]surrounding the table. From up here you can see the whole dining room. [end if]"
The Dinner Table is an enterable supporter. The Dinner Table can be climbed. The Dinner Table is in the Dining Room. "[if the player is not on the Dinner Table]The dinner table dominates the room, overshadowing everything else with its promise of tasty past and future." Instead of entering the Dinner Table when the player is not on the Dinner Table, say "Perhaps you could climb up there?" Instead of climbing or entering the Dinner Table when the player is on the Dinner Table, say "You're already up here." Instead of climbing the Dinner Table: say "You jump high, higher, and then clamber up onto the dinner table. "; move player to the Dinner Table. Instead of going down when the player is on the Dinner Table, try getting off the Dinner Table. After getting off the dinner table, say "You hop off the dinner table, landing on the floor with a mighty (small) oof." 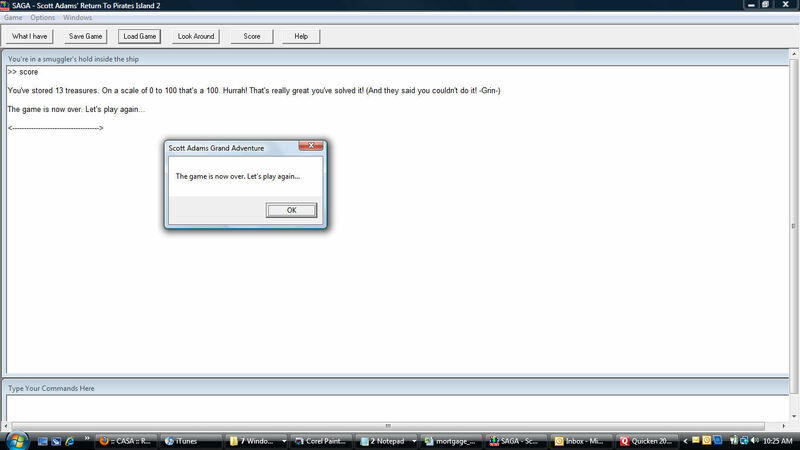 With these refinements, we have created a very small, but complete and navigable game world. Next time, we'll set up a few physical obstacles to help drive the story. Atari 7800 News - New Expansion Module Coming Soon! 8-Bit Rocket has a great interview up with Kurt Vendel of Legacy Engineering. Vendel was responsible for the Atari 7800 High Score saving cartridge released some years ago, and his company is now taking preorders for an expansion module that lends the venerable 7800 some very interesting new capabilities. Most interesting from a retro perspective, he's packaging it in an unused official Atari case design, producing an official vintage-style box for it, and using hardware that would have been feasible circa the mid-1980s. Wii Virtual Console -- Back to the usual silence this week. DSiWare -- Just two briefly-titled games this week. FIZZ is a puzzle game with aligning/linking colors set in an outer space environment. ZENONIA is a substantial RPG with character classes and skill trees. XBox Live Arcade -- Four new titles last week, three of them sequels. Serious Sam HD: The Second Encounter continues the frenetic FPS series, remastered in HD for the 360. Blade Kitten is an interesting platform/action series in two episodic parts from Krome and Atari; it has a nice cel-shaded anime style. Alien Breed 2: Assault is the second chapter of the episodic sci-fi blaster series begun in December 2009. Deathspank: Thongs of Virtue is an insta-sequel of sorts, showing up less than three months after the release of the original game. Game Room -- Back to a more normal schedule, with 4 games unlocked from the new Game Pack 010. 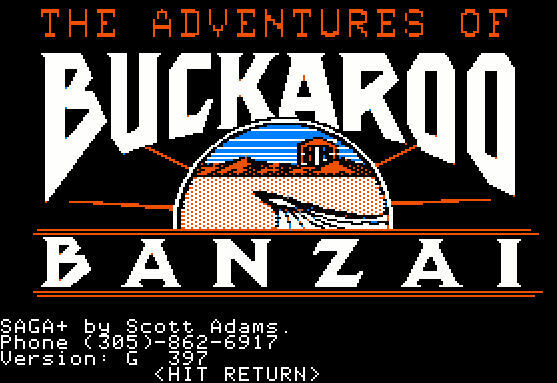 Last week, we got Atari's 2600 game of Bowling (likely ducking in for a few quick sales before the slightly superior Intellivision title turns up), Activision's Plaque Attack for the 2600, the Intellivision minor rarity Horse Racing, and Konami's 1985 arcade game Galactic Warriors, an early one-on-one fighting contest starring robots. Sega's 32X, an add-on for the 16-bit Genesis intended to bring the system up to 32-bit standards, was an unmitigated commercial disaster. 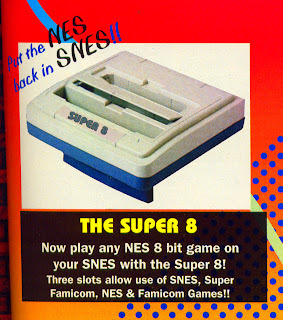 It was rushed to market for Christmas 1994, with a limited launch library, and despite the hardware's impressive 3-D capabilities third-party developers referred to it snidely as the "SNES upgrade." 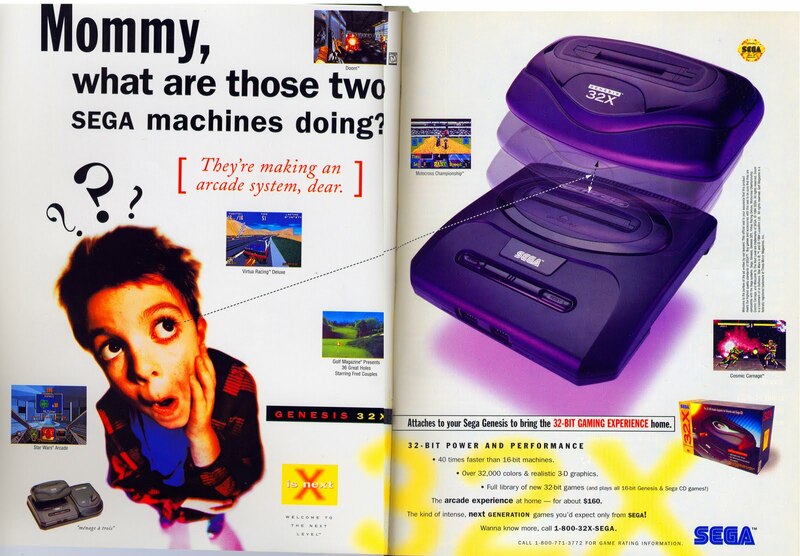 Worse, the 32X debacle may have severely hampered Sega's "real 32-bit" Saturn launch the following spring, by making formerly loyal Sega fans feel like they'd been suckered into buying a system that was obsolete before it ever hit the shelves. Sega's misstep, it can be argued, essentially handed the 32-bit market to Sony. No, I'm not talking about the Amish courtship tradition, also known as Gee, Dad! It's Temptation! Most of these were simple action, card and board games, written in BASIC to a magazine type-in standard -- no doubt they weren't selling tremendously well when this catalog was produced, so the $8-to-$21 original price had become a moot point. 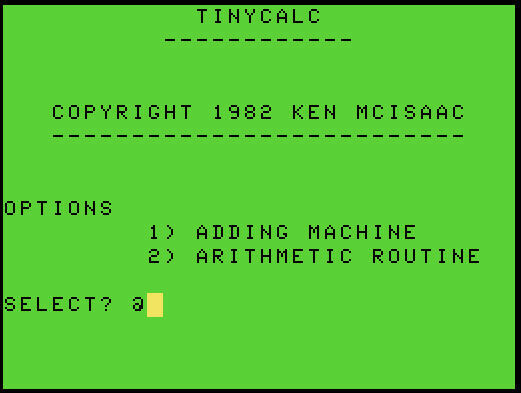 I don't think Tiny Calc is even a game -- I believe it was designed to turn your expensive TRS-80 Color Computer into a pocket calculator. UPDATE: tfernando's comment below raised a worthwhile and inspired further investigation. Tiny Calc was slightly more powerful than I had assumed -- it could function as an adding machine OR as a pocket calculator! 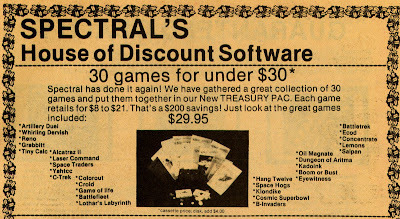 It just makes one realize how kind the passage of time can be to gamers' wallets. 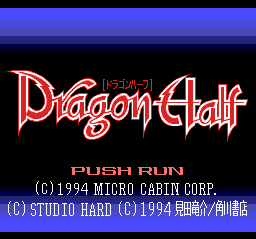 Lately I've been playing a lot of Japanese games more or less successfully, so it's actually kind of refreshing to encounter Dragon Half, an odd RPG-board game hybrid based on the popular manga and anime series. I can deduce a little bit of what's going on, but with my extremely limited knowledge of Japanese and no clue as to the ultimate object of the game, I hesitate to say that I'm actually playing it. 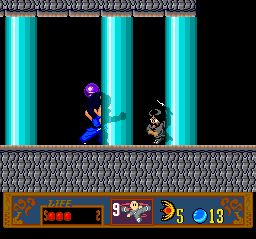 The game was released by Micro Cabin Corp. in 1994, fairly late in the PC Engine's life cycle, on the Super CD-ROM format. 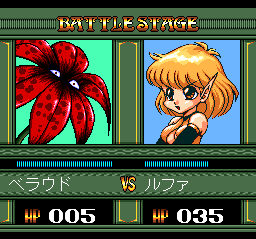 According to Wikipedia, the original Dragon Half series ran in print from 1998 to 1994, with the anime OVAs released in 1993, so this game would have been a coda of sorts for the series, which often parodied RPG conventions. The design is also technically interesting, in that it uses the onboard sound chip for all of the in-game music, reserving the CD capacity for loading graphics on the fly, and it does so fairly seamlessly. 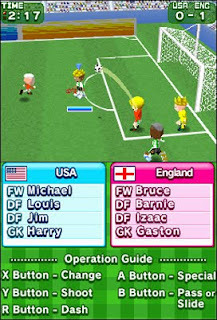 The game supports up to 4 players using the PC Engine's multi-tap adaptor, but even in single-player mode, there are four pre-defined teams, with the CPU handling any teams not assigned to a human player. There's a second setup menu available -- the text is completely in Japanese, so I'm not absolutely positive, but while it seems there are options for turning sound on and off and speeding up play, there are always four teams in action. The game proceeds in board-game fashion -- each team rolls the die (it's more like a spinner, actually) and moves around the board using the resulting number of movement points. The board is structured as a map -- there's no specific beginning or end, and the layout has loops and branching roads. 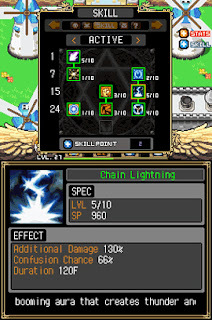 The team can make decisions about which way to move during its turn, but must use up all the rolled points, which can make landing on a desirable node difficult. Of course, I can't quite tell which nodes are desirable, as I can't read the text or understand the characters who pop up to offer advice. I can see that they're color-coded as red, blue and yellow. And I know that after stopping on a node, the party encounters advice from other characters, visits an inn or shop, or enters a Battle Stage. 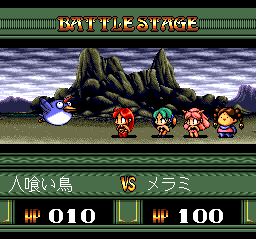 The battles are fun, nicely animated with some funny attacks and results. But in the end, while I had no problem maneuvering around the board and participating in battles, I couldn't figure out the actual object of the game. 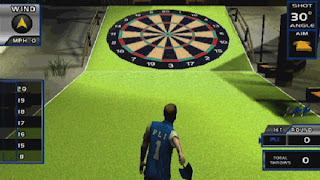 Teams are unable to battle each other when they collide, it seems, and the board is circular in nature, with no clear end goal. We earn experience and money along the way, which may have some bearing on the victory conditions, but that's all I have to say about Dragon Half -- without a working knowledge of Japanese, it remains largely unfathomable. As you can see, the Odyssey was a very simple machine -- big, white squares on a black background were displayed on the TV screen, with the color and flavor provided by plastic overlays taped onto the TV screen. 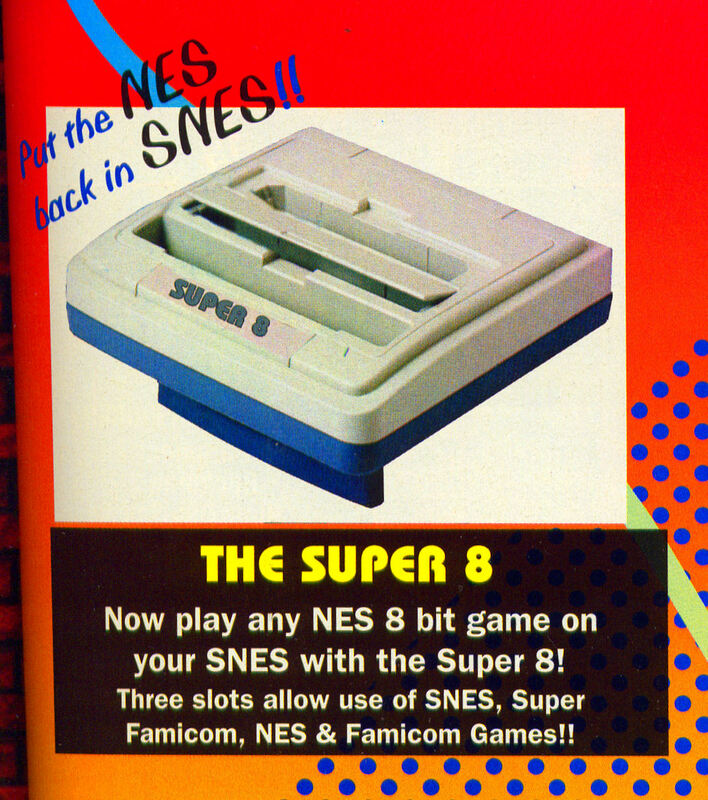 The system featured "cartridges" that were essentially jumper collections, rewiring the internal board's analog logic components to construct specific games, all of which came down to moving squares. In this ad, we can see Magnavox doing its best to inform people that the Odyssey would work with ANY brand of television, not just Magnavox sets, which was a common misconception at retail. We can also see that TV sets were relatively small at the time - no videogame system today would specifically target 18" to 25" screens. 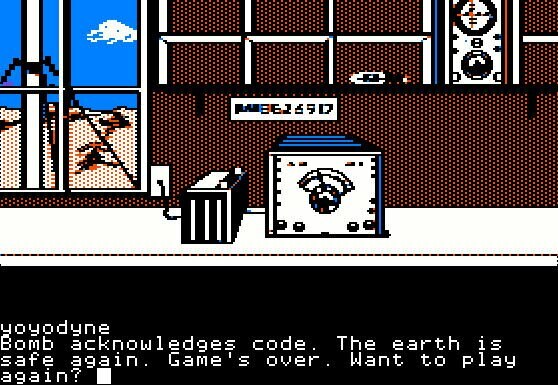 And you can see that the nascent game industry was already striving for some sort of respectability, with a Geography game. 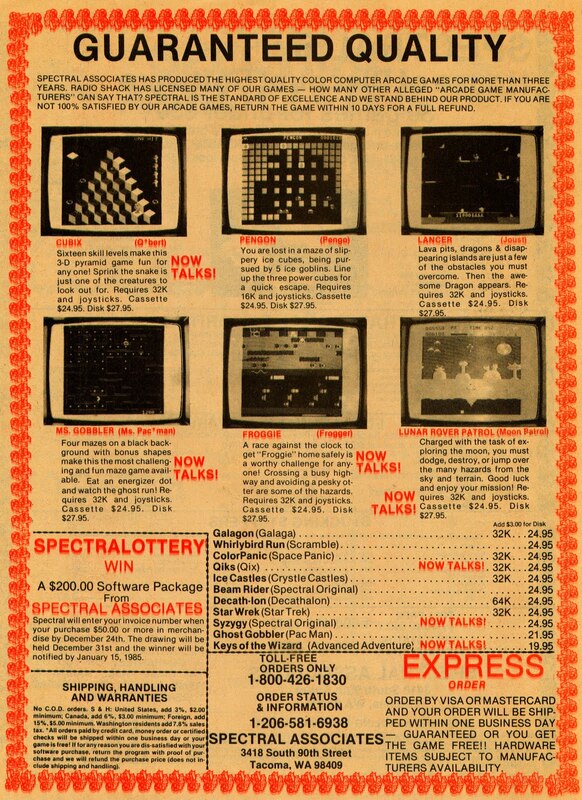 There was no such thing as a home computer in 1973, so the ad doesn't try to evoke futuristic technological imagery -- it does call it the "electronic game of the future," but the selling proposition is that it's something fun and new to do with your living room TV. And it doesn't focus on kids, which is an interesting and remarkably prescient choice. Best of all, it even appears that Mr. and Mrs. Lecherous Coffee Drinker are moving their paddles in synch with the action on the TV -- they're actually playing the game! I had to rewatch that shot several times to convince myself, but you can see that the player paddle is controlled by the right-hand knob, and everything's happening in real time. Of course, videotape was also still maturing, so simulated display options were limited. And there's no great challenge involved here -- evenly matched partners can have fun at any skill level. It's no surprise that modern Wii/Move/Kinect ads have this same sort of feel. 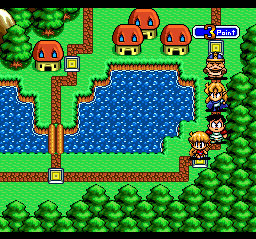 Wii Virtual Console -- The revived incarnation of Sunsoft continues to keep the Virtual Console flame alive, with Aero the Acrobat 2 this week. 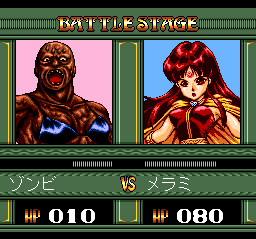 I'm still waiting for some of those TurboGrafx-16 Nihon Telenet titles to show up; hopefully we'll see some activity there before we get, say, Zero the Kamikaze Squirrel. DSiWare -- Three new titles arrive. Nintendo Countdown Calendar allows users to set event dates and track countdowns. GO Series 10 Second Run is a high-speed, ultra-short platforming challenge with 50 levels. Everyday Soccer is a generic soccer game with some character customization and online features. XBox Live Arcade -- Three new downloadable games last week, despite Halo Reach dominating the platform. 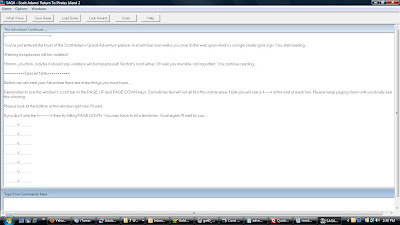 Sonic Adventure brings Sega's Dreamcast game to XBLA. Space Invaders Infinity Gene is more from Taito (see PS3 version below.) And King of Fighters: Sky Stage is... a shooter starring the cast of SNK's legendary fighting game series. So crazy it just might work, with Mai Shiranui bringing her sizeable talents to the fore along with five other classic KOF characters. Game Room -- A change in the pattern, with just two new games last week, both of them pleasantly obscure Konami coin-ops. Flak Attack is a vertical shooter of the usual variety. Kitten Caboodle is a cutesy block jumping/pushing game, with a gambling minigame and more than a hint of Pengo about it; it's quite a bit of fun in small doses. 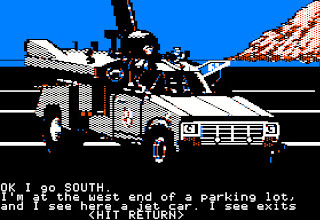 The Spectral Associates games approximated their inspirations fairly well given the capabilities of the CoCo, and as a customer back in the day I was rarely disappointed. 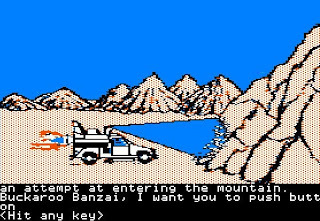 But nobody would have mistaken Pengon for anything but a Pengo rip-off, or Lunar Rover Patrol for something other than Moon Patrol. 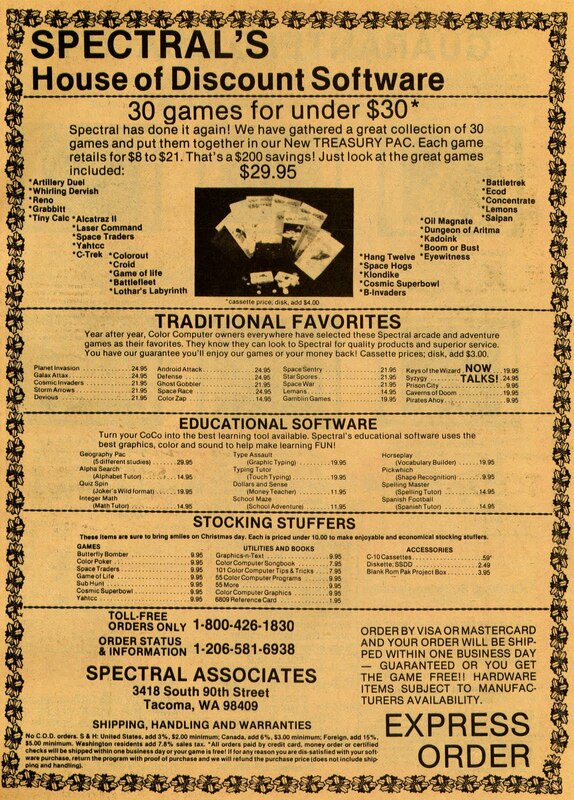 And just in case you haven't visited an arcade, or imagine Ms. Gobbler to be something less than wholesome, the Spectral Associates catalog helpfully identifies the illegitimate source of each and every bit of stolen intellectual property. 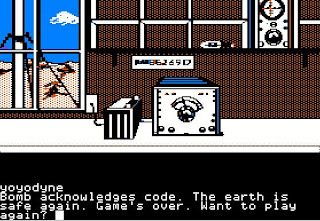 It's telling that when Tandy picked up Spectral's Color Meteoroids as an official Radio Shack cartridge release, the name was changed to Microbes, with the manual's backstory (though not the gameplay) changed to describe a spaceship microscopic germ fighter shooting asteroids microbes that split into smaller rocks single-celled organisms, while dodging UFOs hostile antibodies. And calling a game a "Spectral Original," when it's obviously a clone of Taito's Electric YoYo and/or Midway's Solar Fox, then selling it using the name of an unrelated Activision game, Beam Rider, is a bit much even by these standards. But that's how the industry rolled back in the day. Back in 1991, comic martial arts actor Jackie Chan was known on American shores only to die-hard kung fu movie fans and Cannonball Run aficionados. 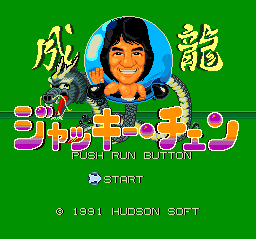 But he was a major star in Japan, which is why Hudson Soft produced Jackie Chan for the Famicom and PC Engine (as the company's thirty-sixth title for the machine.) 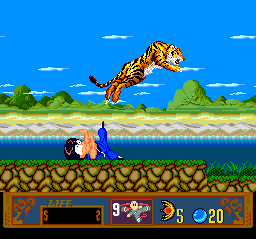 The game was a solid platformer, with particularly nice graphics on the PC Engine, and it came to the US for the Nintendo Entertainment System and even the TurboGrafx-16 as Jackie Chan's Action Kung-Fu. 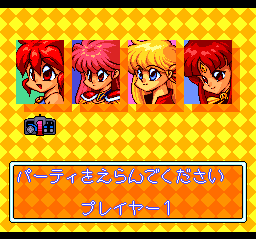 We're looking at the PC Engine/TurboGrafx edition here. 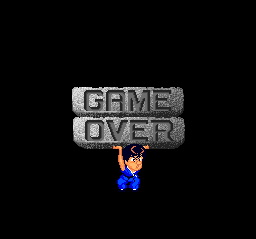 Befitting the actor's stature, videogame Jackie Chan has a number of attacks at his disposal -- he can punch and kick, crouch and low kick, and leap through the air for a flying kick, with some more complicated fireball and spin kick moves available as the game progresses. 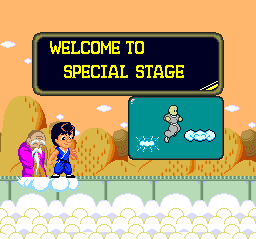 Jackie Chan is a charming little Hudson platformer, with solid controls and memorable music. 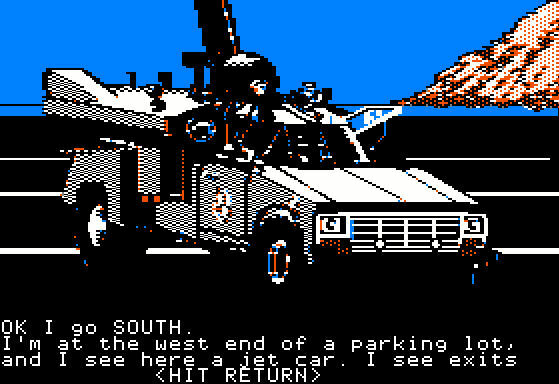 The license was unfortunately too far ahead of its time in the States, but knowledge of Mr. Chan's work isn't essential to appreciating the gameplay, which still holds up well almost two decades later. 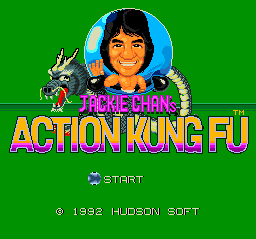 Jackie Chan hasn't been remade or released on the Wii Virtual Console, probably due to re-licensing issues, and it's gained some value as a licensed collectible, so it's not always easy to find at a good price. It may be available for purchase here.